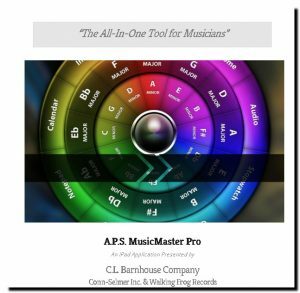 PDF Viewer and Annotator for Sheet Music, Scores, or anything PDF – includes multiple pens, highlighters, “stickies” and colors to use. It also allows you to export and import PDFs in a variety of ways including exporting via e-mail. Chromatic tuner with pitch pipe functionality – calibration options from 420-460 Hz. Audio Recorder and Player – record at three different qualities, e-mail your recordings, open and play any of your iPod library and play-lists directly from within the app. It truly is the “All-in-One” iPad tool for musicians! I hope you all will shortly find this one of your MOST FAVORITE music tools!